You may have noticed that I don’t really do product reviews around here. I appreciate reading reviews elsewhere, but I’ve never been pitched a review that didn’t feel like it would be totally awkward for me/this space/people who read this site. 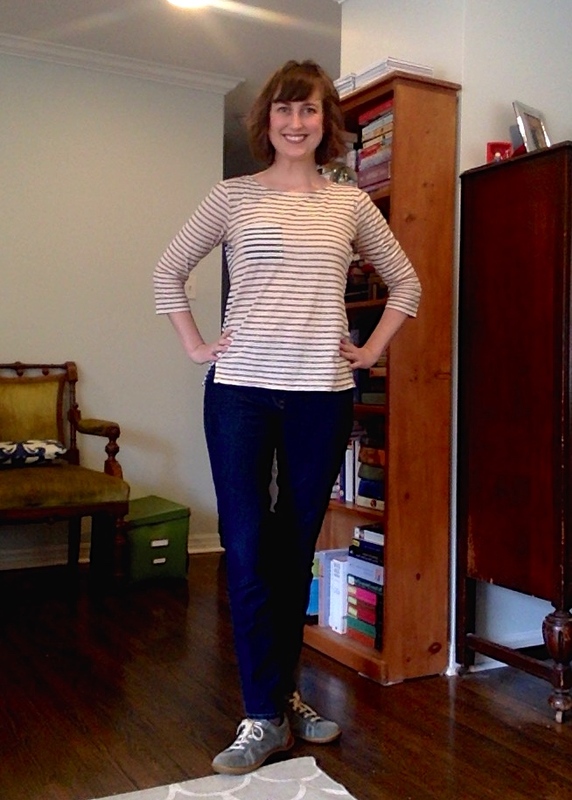 However, I do from time to time get evangelical about things I’ve bought that I love (does anyone else fondly remember Mindy Kaling’s shopping blog, “Things I’ve Bought That I Love?”), like my IUD, and now, my life-changing jeggings. Yep, hold onto your lusty hats, this is a review about jeggings. First, some backstory. As you may know, I birthed twins who weighed in at 6 lbs each. My pregnant belly was insane. At one point during my pregnancy, I felt a distinct sensation like burning fire down the middle of my stomach. It was my abs ripping apart. And they never fully went back together. This means that I’ve had to come to accept a very new midsection than the one I had before babies, and in this new world, most pants are really uncomfortable to me. To get super graphic, usually the button tries to find its way into the dent in my stomach where my abs used to come together. It’s INSANELY uncomfortable, like the buttons want to find their way inside my body, through the thinnest and most sensitive point. Sometimes I solve this problem with higher waisted pants that hit me above the separation. Other times, I stick to elastic waistbands. But still, I miss wearing jeans. I like the way they look, if not the way their waistbands make me feel. 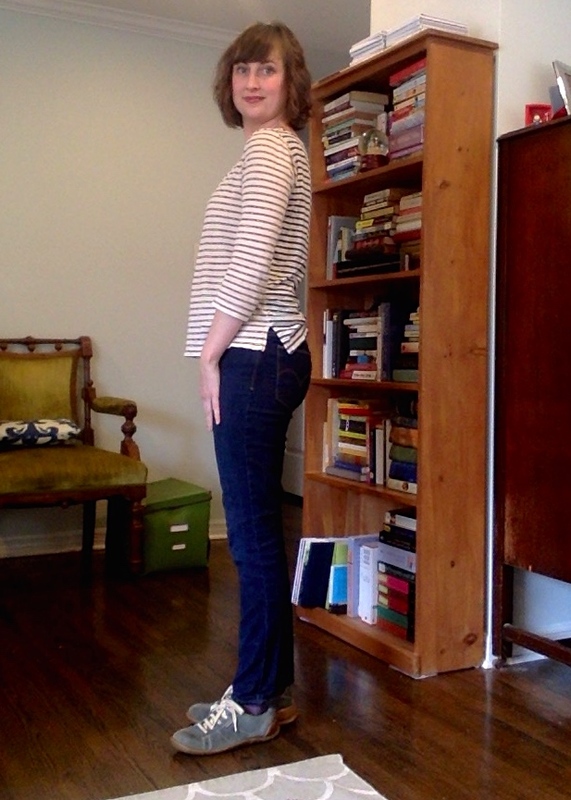 I would often wish I had kept some of my maternity jeggings, which looked like real jeans, except for their soft pull-on waistband, and even contemplated buying myself some maternity pants, though that felt like admitting some sort of defeat. 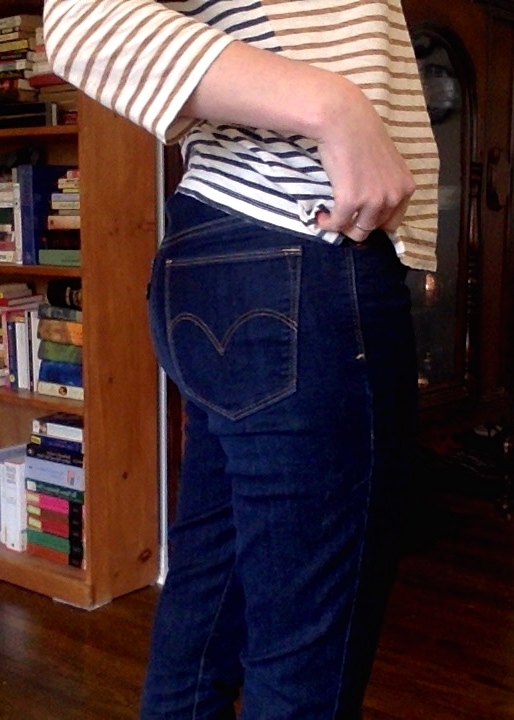 Then, in the comments section of a Jezebel piece, I discovered that Levis does in fact make non-maternity pull-on jeggings. Since they’re $40 and ship free on Zappos, I ordered two pairs and hope hope hoped they’d be everything I was dreaming of. Yes, I dream about pants, don’t you? Now, I admit, the waistband is obviously not “real,” but as exposing my midriff in public is something that I only do in bad dreams, all of my tops are long enough that no one will ever know. 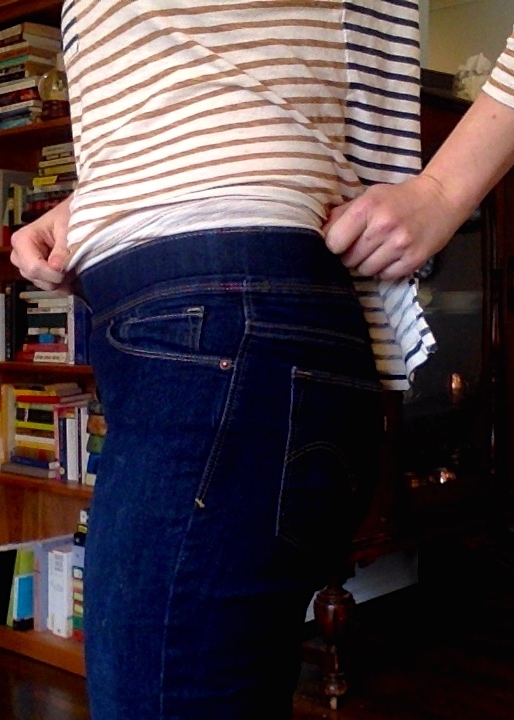 If anything, the lack of a button makes for a smoother line under my hip-length tops anyway. 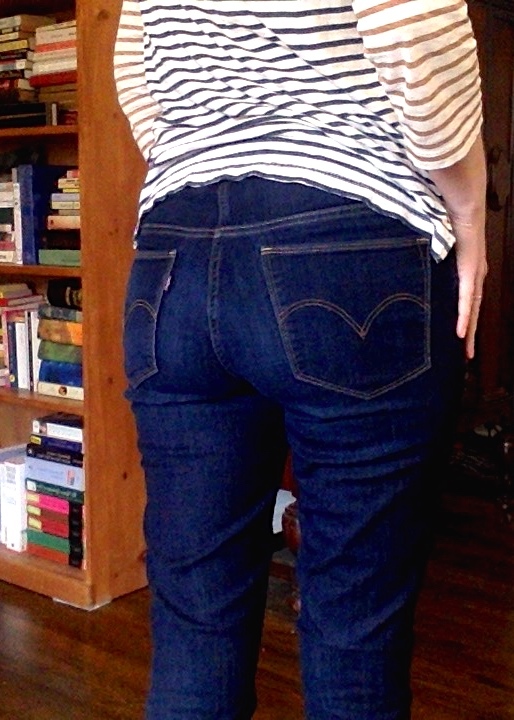 A note on sizing: I was tempted to size up, but ordered the same size I wear in my regular Levis and other pants from Gap and Old Navy, and I would say that these fit true to size. I’m beyond a happy customer and love them so much, I’m irrationally considering ordering several more pairs just in case there’s an apocalypse and they disappear from the shelves tomorrow (note to my husband, I’m not actually doing that…yet). Bottom line: if you’re a lady who finds the waistbands of most pants uncomfortable, you should try these. I’ve already convinced several friends to order a pair, and am now on a one-woman mission to save the women of the world from uncomfortable waistbands. Hi. 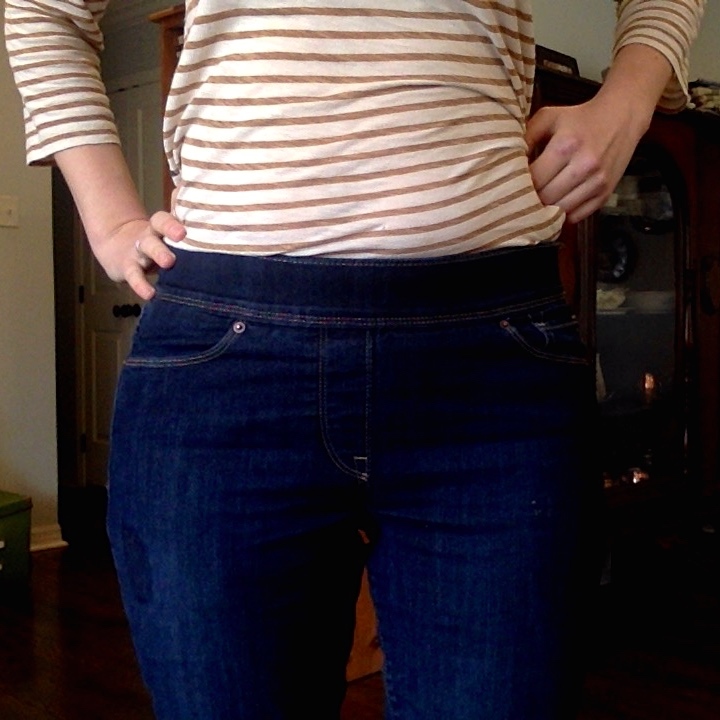 I’m the crazy person who just used PhotoBooth to take pictures of my jeggings. I feel kind of insane. I would be the world’s worst fashion blogger. Note: this is not sponsored. 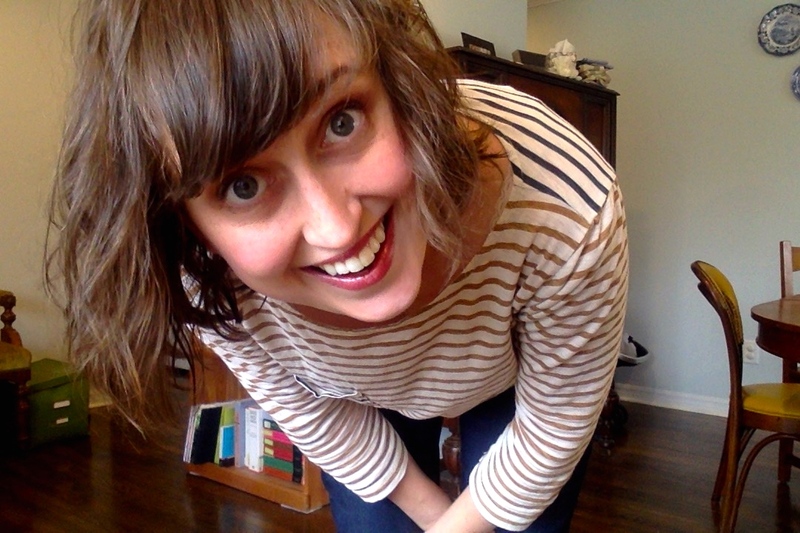 I bought my life-changing jeggings with my own money. If you’re from Levis and you want to send me 10 more pairs, I certainly would not object, though. Ok, you guys, I had to share this. I walk past that mecca of hipster fashion, American Apparel, on my way to my office every morning. And what I saw took me back to 1992. I swear I had this dress, and wore it with leggings and a side ponytail and a hairbow made of neon shoelaces. If you’re a girl, born in the 80s, I bet you had something similar. My question is, why do hipsters want to look like me, circa second grade? Perhaps there’s no use questioning it, though. Afterall, this is the same company that also makes see-thru mesh dresses, and a strange assortment of neon spandex horrors. In college, I took “Aerobic Dance” as a P.E. class. It involved watching a very old VHS workout video with a woman who would have been right at home in that shiny pink-and-mesh leotard. Heaven help me when the first hipster college kid comes into my office wearing something like that. I might roll my eyes so hard they get stuck. SERIOUSLY? The crotch of those “harem pants” is more like “I pooped my pants.” That is one high-wasted, tapered leg, poulterwang-inducing FREAKSHOW of a garment.